Not all swimming pools are the same. 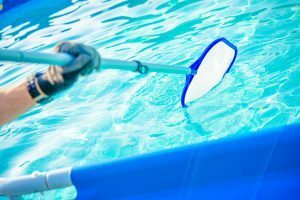 The problem of keeping your pool clean is dependent on a lot of factors. However, there are common tips that every pool owner can use to keep their swimming pool sparkling clean. The first line of defense against a dirty pool is skimming the surface daily. Remove those floating leaves, bugs, and anything else that floats at the top of the water. If you do this kind of cleaning daily, your weekly pool maintenance will be significantly reduced. According to a pool maintenance guide by eBay, floating debris will sink to the bottom eventually, so you should catch it while you can. Debris at the bottom of a pool is much harder to clean. Cleaning out the strainer basket regularly will keep your pool running efficiently. A basket that’s periodically emptied out weekly will function better than one that’s continually clogged with leaves and debris. EBay’s maintenance guide says simply taking out the basket and shaking it is enough to clean it. Vacuuming your pool each week will help the water stay cleaner, longer. Use the specialty vacuum that comes with your pool, and vacuum along the bottom and sides just as you would with a regular vacuum. Additionally, brushing the walls and tile will cut down on the amount of algae that wants to grow there. It will also keep calcium deposits at bay. You don’t need to clean your pool filter weekly, but you should make sure you maintain it every few months. Most swimming pool experts agree that the max amount of time you should go between filter cleanings is four months. A pool filter that works well is an additional factor that will keep your weekly pool maintenance simple. It’s important to check the water level weekly. Water is continually leaving your pool through evaporation, splashing, and people entering and exiting. If the water level gets too low, the pump can be damaged. Last but not least, don’t forget to check your pool water’s pH levels on a weekly basis, too. The pH level must be safe for people to swim in it; there is also an optimum pH level for pool sanitizers to work at their peak performance. 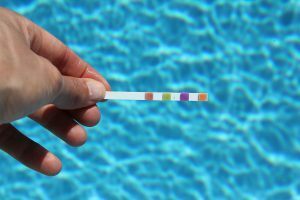 Home testing kits are available almost anywhere pool accessories are sold and allow you to test the water yourself and correctly adjust the pH with the right chemicals. If you want a perfectly clean and clear pool, remember that this ultimately depends on you. However, pool maintenance can be an easy job with just a little bit of upkeep. Doing only a slight amount of weekly pool maintenance will end up saving you both time and money. Follow the above five tips and you will have a pool that your family and friends will want to dive into all summer long. Alpha and Omega Pool Services can help you keep your pool crystal clear, too. Call us today for reliable pool cleaning, services, or maintenance.